Moss decorated the edge of the stones. It was a deep, old green at its base where it spread out and clung to the pocked terrain of the rock face and a powerful, bright green at its surface where it accentuated tiny islands of vibrant color. The moss was wild genius and Winston rubbed his head against it. He could not see its color, however, as it was the middle of the night. And while the sky was clear and the moon was out, everything reflected but varying shades of blue. But he could feel the moss anyway, and it was spongy and pleasantly abrasive. Wind whistled low over the stones. Before him was a tunnel and the ancient stones framed its entrance. The moss was a badge of seniority. A small window of moonlight hovered in the black mouth of the entrance reassuring an exit to any traveller venturing to pass. Sobered by the wind Winston looked up above the entrance at the enormous wall stretching as far as the eye could see to the left and right. 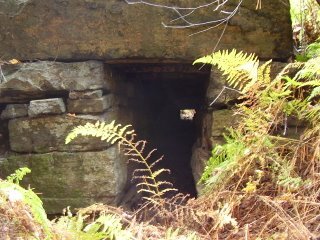 He looked at the wooded ravine behind him, leading up to the entrance of the tunnel. The wind whistled again and Winston disappeared into that black mouth towards the patch of blue moonlight beyond the towering wall.